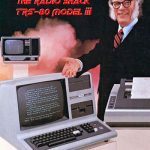 When the TRS-80 Model III was introduced in July 1980, Radio Shack’s line of TRS computers was king of the PC industry. Touted as the most affordable business computer, the Model III was arguably the apex of the Shack’s early computer offerings. Even Isaac Asimov had one! Brad Arnold is going to give us an in-depth look at this ubiquitous machine at the Atlanta Historical Computer Society meeting on Saturday, May 19th, at 2pm. We will also get a first look at Brad’s new computer media collection, which is being made an AHCS club project. You are most welcome to bring historic computer media to contribute or just for show and tell. This entry was posted	on Friday, May 11th, 2012 at 3:30 pm	and is filed under Meetings. You can follow any responses to this entry through the RSS 2.0 feed. Both comments and pings are currently closed.